Having an ample amount of life insurance can be important at any age. While those who are young and may have small children should purchase this type of protection for ensuring that their loved ones can go on financially, it is also essential for those who are older - even without anyone who is counting on them for financial support - to still ensure that they have some coverage. One of the biggest reasons for this is so that final expenses can be paid. Final expenses can include not only the cost of a funeral, but also items such as a burial plot, a head stone, transportation, and flowers - which when all added together, can be more than $8,000 to $10,000. A primary way to help make sure that these expenses are easily taken care of without your family or loved ones having to dip into their savings, is to purchase a good, solid burial insurance policy. Burial insurance is a type of life insurance coverage that is typically purchased to insure that one's funeral and other possible final expenses will be taken care of. This is why burial insurance is oftentimes referred to as funeral insurance or final expense coverage. Having this type of coverage can be an ideal way to make sure that your loved one will not have to use their own funds, or be forced to put the high cost of final expenses on credit. In fact, knowing that these costs are already taken care of can provide a great deal of peace of mind to those whom you care about, at an already stressful time in their lives. Burial insurance works primarily just like any other type of life insurance coverage. For instance, you will pay a premium in return for the life insurance coverage. Then, upon the death of the insured, the funds from a burial insurance policy will be paid out, free of income taxes, to your named beneficiary (or beneficiaries). These policies are typically issued to those who are considered "seniors" and who are between the age of 50 and 85 - although there are some life insurance carriers that will provide this coverage to people who are older. In many instances, the death benefit amount that is on a burial insurance policy is between $5,000 and $25,000. However, there are cases where you could purchase this type of coverage with a much larger amount of benefit. (Oftentimes, the amount of death benefit that is allowed will be determined, based on the applicant's age. For example, those who are in the older age groups such as 80 or over, may be limited on the maximum amount of coverage that is available). In some cases, a burial insurance policy holder may opt to have the proceeds of the policy go directly to a funeral home. This way, many of his or her final expenses can be more quickly paid off to the service provider. Here, if there are any proceeds left over after paying out the final costs, these funds can then go to a named beneficiary. What Types of Policies are Available as Burial Insurance Coverage? Just as with other types of life insurance coverage, there are different options with burial insurance plans. These will include both term and permanent coverage. If you choose to go with a term insurance plan, you will have death benefit coverage, yet without any cash value build up in the policy. A term life insurance policy is purchased for a certain time period, such as five years, ten years, 15 years, 20 years, or even for 30 years. The length of the coverage duration may at times be based on an applicant's age at the time they apply for coverage. There may also be one-year annual renewable term insurance available. You may also opt for a permanent burial insurance policy. In this case, you will have both death benefit coverage, as well as cash value, build up. Unlike term insurance, a permanent life insurance policy will offer protection for the remainder of your lifetime - provided that you continue to pay its premium. Typically, the amount of the premium that you are charged for this type of coverage will be guaranteed not to increase over time - even in light of increasing age and / or the contracting of an adverse health condition. The cash value that is inside of a permanent life insurance policy is allowed to build up over time on a tax-deferred basis. This means that you will not be required to pay taxes on the gain of these funds, unless or until the time that you withdraw it. Cash that is in a permanent life insurance policy - including burial insurance plans - can be either withdrawn or borrowed by a policyholder for any reason. These can include the supplementing of retirement income, the paying off of debts such as your mortgage, and / or even for taking of a nice vacation. It is important to note, though, that if an insured dies while there is still an outstanding balance in his or her cash value component, the amount of that balance will be subtracted from the proceeds that are paid out to the policy's beneficiary. Therefore, if your beneficiary is counting on a certain amount of money to pay off your final expenses, it will be important to repay any loan or withdrawal or to leave the cash inside of the policy. Will You Qualify for Burial Insurance? One of the primary benefits of purchasing burial insurance is that it can be easier to qualify for than a regular, medically underwritten life insurance policy. In many cases, there is no medical examination that is required as a part of the underwriting process - and because of this, even if a person has certain health issues, he or she could still qualify. With no medical exam, there is no need to worry about giving a blood or urine sample to the insurance underwriters. Also because of the no medical exam requirement, a burial insurance policy may also be approved much more quickly. This is because there is no medical information for the life insurance underwriters to review. With this in mind, if you apply for a policy for burial insurance, you could potentially have the coverage approved and in place within just a matter of a few days - or possibly even sooner - as versus weeks (or longer) with regular types of life insurance. There are several ways to determine how much burial insurance that you need. For example, it is often a good idea to contact several local funeral homes (or funeral homes in the area that you plan as a final resting place). In doing so, you will be able to obtain an approximate idea of just how much these expenses can be. In addition, there are many purchasers of burial insurance who will also add in some additional insurance coverage. These funds can be for the payment of any uninsured final health care costs, and / or for other possible needs, such as paying off personal debts. If you do not have any other types of life insurance in place, you could add an additional amount of coverage when you purchase burial insurance. These funds could be to help in supplementing a spouse or partner's ongoing retirement income and / or for the payment of possible estate taxes. (Although in this case, it is important not to have the face amount of the burial insurance policy added as a part of your overall estate. If it is, it could be added to the amount of estate value that you will be taxed on). When shopping for a burial insurance policy, it is important to first shop and compare several different plans from different life insurance companies. One reason for this is because the amount of the premium that you are charged can differ a great deal - even for the very same type and amount of insurance coverage. It is often the easiest and most convenient to compare several different burial insurance companies by working with an agency or an independent brokerage company that has access to multiple different insurers. This can be much faster and easier than going to each individual insurance company to obtain information about their policies, benefits, and their premium cost. 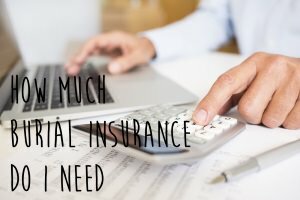 When you review different life insurance carriers, it will be essential that you ensure that they are strong and stable from a financial standpoint and that they have a good reputation for paying out their policyholder claims. In doing so, you can review the financial strength of a life insurer by checking the ratings that have been provided to them via the insurer rating agencies. These include A.M. Best, Standard and Poor's, Moody's, and Fitch. While these ratings will all differ slightly, these agencies provide letter grades, similar to a report card. In most instances, it will be best if you stick with an insurance company that has a rating of A or better. You can also check for information about the insurance company via the Better Business Bureau (BBB). A company may or may not be accredited through the BBB. However, they may have a grade given by the BBB of between A+ and F. In addition, you can check the Better Business Bureau's website in order to see how many complaints - if any - have been closed out by the insurance company over the past three years, as well as over the past one year. Who is a Good Candidate for Purchasing Burial Insurance? In determining whether or not you are a good candidate for burial insurance, there are some factors to consider. First, do you currently have a plan in place for paying off the high cost of final and funeral expenses? If not, then a burial insurance plan may be a good option. Even if you already have other life insurance coverage in place, having burial insurance coverage can take care of your final expenses, while the other coverage can pay off your debts such as a mortgage, credit card bills, and other key obligations. Also, if you are not in the best of health, a burial insurance policy can allow you to obtain life insurance coverage, yet not need to take a medical exam to qualify for this type of coverage. The cost of life insurance coverage will be dependent on many factors. These will include the type and the amount of coverage that you are purchasing. It can also be dependent on your age and gender. When seeking the best premium for your burial insurance policy, we can help. We work with many different life insurance companies that offer burial insurance coverage - and we can assist you with obtaining all of the important details that you will need for making an informed purchasing decision. We can do so quickly and easily for you, without the need to meet in person with a life insurance agent. In order to begin the process, all you need to do is just simply fill out the form on this page. Should you still have any questions, please feel free to call us directly, toll-free, at 877-235-9299. Our experts are happy to assist you with obtaining quotes, as well as answering any of the questions or the concerns that you may have about purchasing burial insurance coverage. We understand that the purchase of any life insurance can be a bit overwhelming. There are so many different variables to keep in mind - and you want to be sure that you are getting the right amount and type of plan. So, contact us today - we are here to help.